Josh, Carl, Sava, and I fight the flood to plant a tree! Yesterday it was the most exciting tree planting I’ve ever experienced. 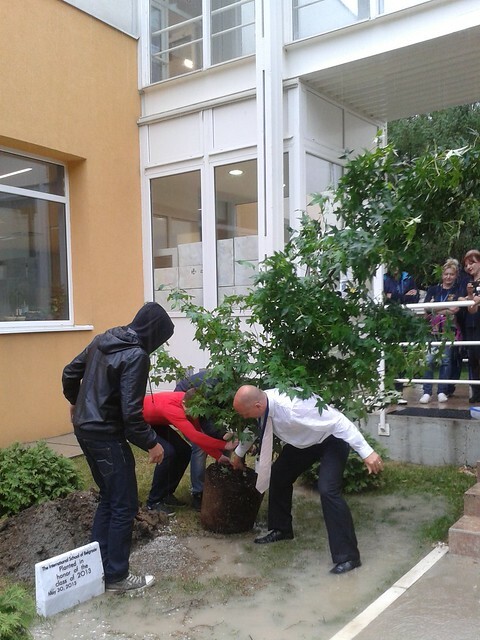 The Class of 2013 planted a tree in front of the middle school during the hail storm. The Senior Class Awards Assembly was timed perfectly with the rain, and by the time we got out to the spot in front of the new building, rain had filled the hole dug for the tree. The boys persevered and it was a good lesson – things in life do not always go as planned, and one has to make the best of any situation. Tree planting ceremonies in schools symbolize planning for the future and long-term thinking, stewardship of environment, and the value of education, sowing the seeds for future success, etc. It is an emotional week for the senior class and their parents as their high school education career is coming to an end. The community is invited to come to Saturday’s Commencement Exercises. It has been a memorable week so far, and a tree planting the young men will not forget. The tree is a Sweet Gum (Liquidambar styraciflua) so named because the seed pods resemble “gum balls” and the leaves have a pleasant odor when crushed. The tree was selected for its beautiful autumn colors of orange and red, and it will look nice against the backdrop of the building. It is also a different species of tree and will add to our campus nature “laboratory” that the science classes use to do field studies. Next Post Getting Teenagers Active!